Print-per-order internet publishing technology has broken the back of what was once a major Jewish monopoly in the arts and entertainment field, and allowed us access to quality book-length publishing services at a price that even our destitute Movement’s people and organizations can afford. The playing field still isn’t level, and it never will be, but at least we can get onto the field, which we couldn’t before. The Northwest Migration movement will never be able to match the dictatorship in the money, time, and effort we can invest in promotion and advertisement, nor will we be able to get access to the retail and market sales outlets the establishment publishers have—but at least alternative literature and ideas can get published now. It used to be that publishing and distributing a single politically incorrect book was a major, lifelong project that sometimes literally killed the author, as witness Francis Parker Yockey. The story of all the things William Gayley Simpson had to go through to find a publisher for Which Way Western Man? would fill a book itself. Now, if we can ever address the character issue and create a bona fide resistance movement, we no longer have that technological and logistic hurdle. Can anything be accomplished through fiction? Well, Uncle Tom’s Cabin has been credited with starting the Civil War, and The Turner Diaries has been given credit for inspiring the Order and the Oklahoma City bombing, so the power of the written word shouldn’t be underestimated. Granted, the number of White people who are willing to sit down and actually read a block of type for content is a very small proportion of the White population. But they do exist, and many of them are willing to at least make the attempt if they know ahead of time the book is something politically incorrect and forbidden. We do so much that we shouldn’t be doing, that we never can seem to figure out what it is that we should be doing. It’s as if we’re trying to put together a jigsaw puzzle when we’ve lost the cover to the puzzle box, without knowing what the picture we’re trying to assemble looks like. We can see all the pieces, and we can even fit a few together, but we have no idea what we’re trying to create or how it should work. But what if we did have the cover of the puzzle box? Suppose we had a vision of what we were trying to accomplish? Suppose we could get a glimpse of the great prize itself? Suppose we could look at what we should be doing instead of being constantly told how not to do it? What the Northwest novels do is to give our people a good look at the cover of the box, so that they know what a White revolution should look like, and what a real one might possibly look like. They can get some idea of what they should be doing and how they should be doing it, instead of wandering down endless dead ends. Bear in mind that I am uniquely qualified to do this, because I have actually lived, as a local and not a tourist, in societies where revolution has been accomplished within living memory, where attempted revolution was ongoing, and where I could observe events up close and first hand. I know what the picture on the box should look like, because I’ve seen the real thing. Virtually no one else in the Movement has. No brag, guys, just fact. In the year 2000, as a consequence of the atrocious Morris Dees legal assault on Pastor Richard Butler, I decided that I would write a novel depicting what a future sovereign, independent White nation in the Pacific Northwest would look like, and how such a new nation might come about. This was a challenge because rather than create some work of pure science fiction, I tried to predict and portray exactly how a White revolutionary movement of Northwest independence might succeed, based on the reality of what we have to work with today—all of this on the admittedly far-fetched premise that we ever do in fact get our act together. The result was The Hill of the Ravens, which came out in September of 2003. The novel is set in the middle of the 21st century, around forty years after the successful Northwest War of Independence. In addition to describing a number of aspects of the contemporary Northwest American Republic, including technological advances and a realistic form of authoritarian but participatory government that might actually arise in such a situation, the book deals with events that took place during the guerrilla War of Independence. Unlike The Turner Diaries, it actually has a plot, a whodunnit dealing with the betrayal of a Northwest partisan column forty years before and the identity of the traitor. I should mention that at the time of its publication, I had no idea that The Hill of the Ravens was going to be the first in a series of five novels and the beginning of a whole literary mythos, so there are some minor contradictions, inconsistencies, and paradoxes in THOR that are not present in other novels in the series. I had no sooner finished The Hill of the Ravens when I read it over and realized that while it was a start, it was still inadequate. There just wasn’t enough space to cover every single thing I wanted to cover. I didn’t want the book to run to the length of War and Peace. There were points that should have been made that weren’t made, and there were questions about the Northwest idea that should have been answered that weren’t answered. In August of 2004 I published the second novel, A Distant Thunder, which is essentially the story of a single revolutionary soldier, a Northwest Volunteer, from his childhood as a poor working class White boy until almost the end of the conflict, and of how the revolution began and progressed in a single town in the Pacific Northwest. The Hill of the Ravens is set on a fairly elevated level in Northwest society under the Republic—my protagonist is a member of the State President’s family as well as a senior police investigator, and there is a good deal of fictional high politics and policy discussed. A Distant Thunder is a much more earthy and proletarian re-telling of the revolutionary mythos, and it is done in the first person. It is the memoir of a young White “trailer trash” kid named Shane Ryan, who recounts his youthful experiences growing up in the last days of the old America of diversity and political correctness, his initial contact with the Party and the Northwest independence movement, and his career as a Northwest Volunteer during the Northwest War of Independence. Shane and his comrades of the Wingfield family are not political leaders or generals or Party intellectuals; they are the “grunts” and common foot soldiers of the Northwest revolution, the kind of working-class, normal White people that we must attract to our cause if there is to be any hope. Their experience in the novel is very largely localized, as the book recounts the beginning and the subsequent development and course of events taken by the White revolt in a single county in western Washington. It is the revolution in microcosm and anecdotal detail. I deliberately chose to re-tell the story of this fictional future rebellion in the Northwest from the viewpoint of a bottom-rung Volunteer because I wanted to emphasize something that must—let me repeat that, must occur within the Northwest movement itself, which is that form must follow function and that the coming Party must be created from the bottom up, not the top down. No more self-appointment, no more letterhead organizations, no more of this “if you build it, they will come” crap. In everything else we have ever tried, we set up somebody as Grand Panjandrum with a post office box, a letterhead, and (later) a web site, and then sat back and waited for the bodies to appear and flesh out the empty framework. It’s never worked worth a damn. This time we have to get the real-world, physical bodies on the ground first. This is one of the things I try to show in A Distant Thunder. A Mighty Fortress, the third novel in the trilogy, turned into something of an amalgam of the first two books, including some of the characters. 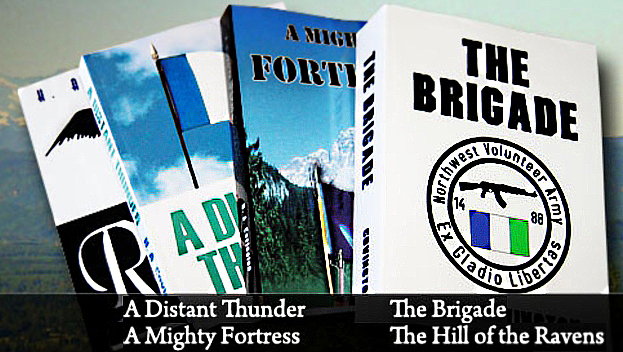 A Mighty Fortress is the story of the Longview peace conference wherein the Northwest Republic comes into being. (Or at least it was supposed to be; it kind of wandered off into a teenaged love story for a while there.) We have never gotten so far even in our wildest dreams, until now, that we have devoted any thought at all to exactly how we intend to bring the present order to an end and replace it with a new one. A Mighty Fortress begins with the NVA as an underground guerrilla movement and follows its transformation into the government of a new, sovereign White nation. I can’t believe that I am the first who ever even seems to have thought about this part of the process, but it looks like I am. Then came The Brigade, which in my opinion is the book I will be remembered for, insofar as I am ever remembered. After AMF I had thought I was all NVA’ed out, and we had taken to referring to the first three books as the Northwest Trilogy, offering them as a set, etc. Then one day in the spring of 2006 I got the old familiar itch, sat down at my archaic computer and just started typing. The Brigade just sort of happened. I still don’t fully understand why, except that apparently I hadn’t said all I had to say on the subject. The Brigade turned into an epic of 335,000 words, the longest work I ever wrote, and it encompasses all of the elements of the first three novels jammed into one. It is for this reason that despite its length, I recommend that new people be given The Brigade first. If they can get through all that wordage it will set their souls on fire. If not, then they have no souls left. In other words, one more excuse to continue to do nothing. Finally I got tired of it. I figured that once more I’d better take these folks by the hand and walk them through it, so when they hang their heads, shuffle their feet, and slink away into the darkness, at least no one can say that it was anything I left unsaid or undone. Freedom’s Sons covers the first 50 years of the Northwest American Republic’s existence, as seen through the eyes of three families—one NVA, one more-or-less pro-Unionist, and one White refugee family forced to flee from the United States into the Republic in order to escape destruction at the hands of Amurrica. There are five sections to the novel, covering the first year after independence, the later attempt by the Americans to re-invade and enslave the Northwest Republic, then a quasi-mystical excursion into the Solutrean theory with a little spy and intrigue thrown in, then a tale of life on the NAR-American border complete with star-crossed lovers and a stupid negress for comic relief. Finally, an epilogue, 50 years after the Battle of Portland began. In these five novels, the Northwest independence movement creates a vision of future White freedom in a country of our own, but more importantly we have now begun the process of changing the White man’s thinking, and hopefully transfiguring his character to the point where he can recover his ancient courage. These books for the moment are the primary items of propaganda the Northwest Migration possesses. They are our answer to what Bush the First called “the vision thing.” They show us what the cover of the puzzle box looks like. They need to get into the hands and the minds of as many White people as possible in our Movement. Because as I have said before—we don’t have a hell of a lot of time left. It is amazing to me that you wrote "Hill of the Ravens" first. I would strongly recommend that readers read "Hill of the Ravens" last of the five northwest novels. That way you can fully appreciate the background for the "who done it" mystery presented in "Hill of the Ravens."